The Associated General Contractors of Metro DC feature Forrester’s Chancery of Morocco work in latest Washington Contractor Magazine. The Associated General Contractors of Metro DC (AGC of DC) featured Forrester Construction’s latest embassy project in the most recent edition of Washington Contractor Magazine. The article highlights the special considerations involved in building an embassy and Forrester‘s experience with similar construction projects. Project Manager David Eason, who has coma number of projects in Forrester’s embassy portfolio, discusses the unique relationship and circumstances. 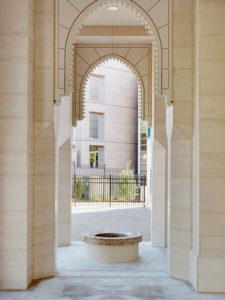 Construction of the Kingdom of Morocco’s new Washington, DC embassy also involved overcoming a number of practical challenges. Built on the last open lot on International Drive, the building site is a particularly sloped parcel. The value-engineering performed by Forrester’s preconstruction and field operations experts resulted in significant cost savings for the owner. Forrester is a long-time member of AGC of DC. Their mission, particularly educating the next generation of great builders, aligns well with Forrester’s values and commitments. During construction, Forrester invited AGC’s Young Construction Forum members to visit the site twice to see the progress and see first-hand how the project team was implementing solutions. Read the full story on Forrester Construction’s latest embassy project.